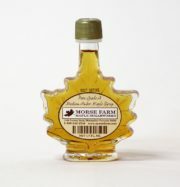 Home > Maple > Grade A Golden, Delicate Taste"
U.S. Grade A Golden Maple Syrup is a lighter and milder Maple Syrup that is delicate in taste and lighter in color. The color of Grade A Golden can be no darker than the United States Department of Agriculture’s visual color standard Golden Color and is reminiscent of the color of a late winter’s afternoon. Golden Maple Syrup is typically processed at the beginning of every sugaring season during colder climates and contains a delicately sweet, original maple flavor characteristic. Since it’s so light and delicate in taste, Grade A Golden is best appreciated drizzled over your favorite desserts like vanilla ice cream, yogurt or in traditional uses like topped over pancakes, waffles and oatmeal.